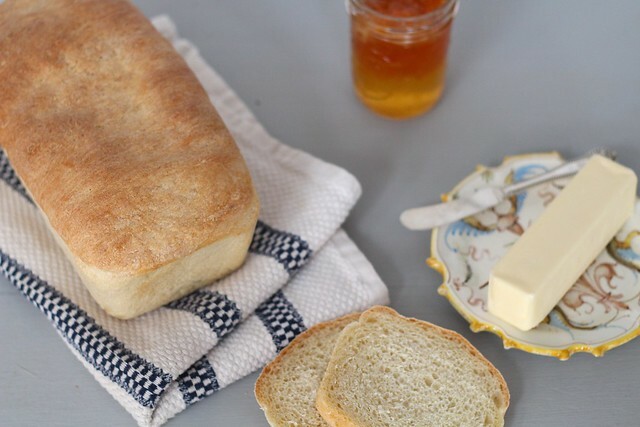 This, my friends, is one of the simplest sourdough sandwich breads. It is the perfect thing to designate to make once a week. It's not daunting because the steps and ingredients are very straightforward. It has that great, slight "sour" flavor thanks to the sourdough starter. It is moist, but slightly chewy. It is the perfect vessel for any desired topping. I love everything from simple toast with butter, to more extravagant sandwiches. Don't even get me started on how well this bread freezes. It doesn't fall apart after thawing out like some other sandwich breads I have made. I like to wrap one of the loaves in plastic wrap, then when it's needed, I thaw it on the counter on a wire rack. Perfect! 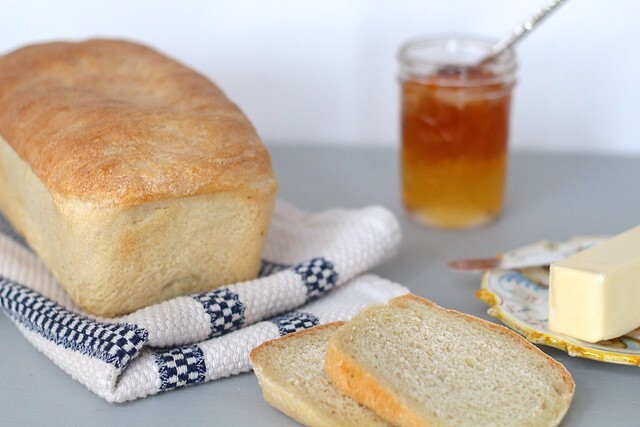 If you've been on the fence about making your own bread, start with this recipe and you won't be disappointed. Combine the water and the yeast in the bowl of a stand mixer fitted with the paddle attachment or in a large mixing bowl. Let stand for at least 5 minutes, or until the yeast is dissolved and bubbly. Stir in the sourdough starter until the starter is mostly dissolved. Add 4 cups of the flour and the salt, and stir until a rough dough is formed. Switch to the dough hook attachment and knead on low speed for 2 minutes. If the dough is still tacky after the two minutes, add more flour, 1 tablespoon at a time with the machine on, until the the dough is no longer tacky. Knead on low speed for another 8-10 minutes, or until the dough is smooth. Turn out onto a lightly floured surface and knead into a smooth ball. Place in a lightly greased bowl. Cover the bowl in well greased plastic wrap and let rise until doubled in bulk, about 2 hours..
Once risen, turn the dough out onto a lightly floured surface and divide in two. Shape each half into rough balls and let them rest for 20 minutes. Meanwhile, grease two 8 1/2 x 4 1/2-inch loaf pans. With one half of the dough, lightly pat out into a small rectangle. Fold into thirds, like a business letter. Pinch the seam closed and roll the loaf onto the seam to seal it. Carefully tuck the edges under, then place, seam side down, into the prepared loaf pan. Repeat with the other half. Cover the pans loosely with greased plastic wrap and let rise until they have risen over the sides of the pan, 1 1/2 to 2 hours. Meanwhile, preheat the oven to 450ºF. Once the bread has risen, lightly spray it with water to make a crispier crust. Place in the oven and bake for 10 minutes. Then, reduce the temperature to 400ºF. Continue to bake for another 20-25 minutes, or until the loaves are light brown and sound hollow when tapped on the bottom. Turn the loaves out of the pans onto a cooling rack. Let cool completely before slicing or storing.